Joel Chan (陳山聰), who took a quiet hiatus from showbiz after his highly-publicized breakup with socialite Florinda Ho (何超雲) earlier this year, will be making a comeback in January 2014. At a company dinner held yesterday, TVB executives Catherine Tsang (曾勵珍) and Virginia Lok (樂易玲) confirmed that Joel has been cast in a new TVB drama and will be returning to the studios in January 2014. Catherine Tsang also stated that management is currently planning new activities for Joel in the upcoming year. Asked if Joel had a no dating rule in his new contract, Virginia Lok laughed, “Impossible! That’s cruel!” She praised Joel that is looking very fit and is prepared for his comeback. wow, he slimmed down alot! The pic above is not his current pic. That pic already been use numerous times in all Joel articles. I knew that he would return eventually but just did not want to admit it earlier. Joel has a lot of potential so I hope he treasures his second chance and does not drop it all again. Glad to see him coming back and good luck to him! I agree HTS. Hope the prodigal son has learnt his lesson. Glad to hear Joe Chan will return to film drama series for TVB in 2014. He is a good actor, and his acting talents should not be wasted. yay! he’s such a good actor! Not everyone can play the roles he does. I’m surprise producers would still want to use him! Why not, if he is a good actor? He was probably a good worker (and in my opinion- a good actor) before he started dating his ex, so they’ve probably never had any bad experiences with him and want to give him another shot. I hope Joe Chan will treasure his “second” opportunity and excel more in his acting. Yeah. Lee Tim-sing in particular really liked Joel. He was very disappointed when Joel decided to leave. I hope Joel doesn’t screw up his second chance up because I can see a lot of potential in him. Why wouldn’t they want to use him? He did not commit any bad crimes they cannot be forgiven. He has the right to a second chance which I believe he will treasure. I think Joel Chan will not be able to do it now as he has lost his “rice provider”. would your boss take you back if you have very bad ethic and doesn’t show up to work? I think Joel Chan is an unusual case. It should not happen to many talented artistes in TVB. I’m looking forward to seeing Joel return. I always liked him as an actor. Hope he will cherish his career more this time around. I like him as an actor too. Is he slim and fit or starved??? I reli love to watch him act..such a talented actor. hope he will treasure this 2nd chance and down-to-earth. All d best!. Joel Chan was the best artistes in “Curse of the Royal Harem”. He carried his role really well, better than all the other artistes in the drama series. And on Last Steep. He was so adorably arrogant and such a hilariously handsome fanboy. Would love to see him and Samantha pair up again. I always like 3C but I don’t think I’m going to watch his return series. What do you mean by “3C”? Really? I thought 3C would be: cash, car and camera (in old days). Tat’s what he is called. Like Kate is Z3 (Zi Sam), Myolie is H2 (Hang Yi), Linda is ++ (Xin Xin). It was anything but quiet. Joel is a good actor. Support. welcome back to earth Joel. 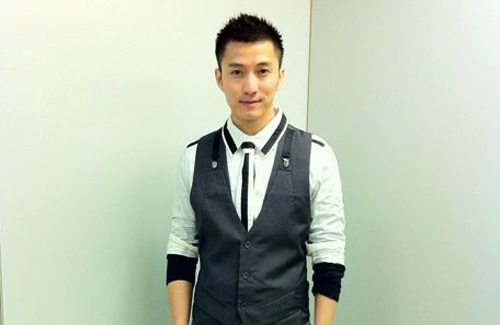 Hi Joel, I hope you will see all the support that you are getting regarding your return to work for TVB. Please concentrate on your career and no more flashy designer wardrobe. You look great dressed like a normal person than those glittering matchy things you ere made to wear. Still don’t like how he treated his ex-wife. It was very bad and mean of him. Good… he’s a good actor. Glad he’ll be back. Yes, come back to TVB… Just don’t do a repeat of stupid career suicide move. May I ask a question? Who is he??? Welcome back Joel, we miss you! If he still look as good as above pic, I am sure he will be be very popular.